An injunction was just filed in the United States District Court, and we are awaiting a date for the hearing. I have attached the public documents that were submitted. You can link to this document via our website: animalfarmfoundation or see it here. 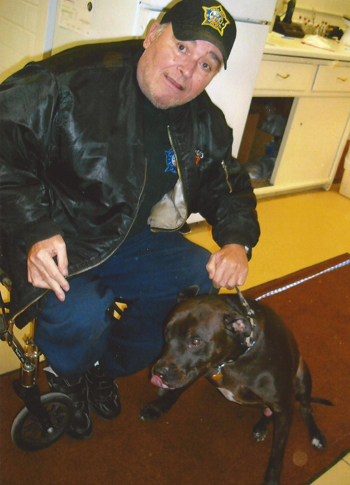 Aurelia, Iowa – James Sak, 65, a disabled Vietnam Veteran and retired Chicago police officer, was forced to relinquish his service dog after the Aurelia Town Council voted December 14 to prohibit the dog, identified as a “pit bull,” from residing within Aurelia city limits. Although the City of Aurelia has breed-discriminatory laws prohibiting residents from owning “pit bulls,” the Council’s decision appears to violate 2010 guidance from the United States Department of Justice (DOJ) on breed limitations for service dogs (“Nondiscrimination on the Basis of Disability in State and Local Government Services”). Sak and his wife, Peggy Leifer, moved to Aurelia in November to live near Leifer’s ailing mother, an 87-year-old longtime resident of Aurelia. Sak was accompanied by his service dog, Snickers, who is certified with the National Service Animal Registry. In 2008 Sak suffered a debilitating stroke that left him permanently disabled, unable to use the right side of his body, and confined to a wheelchair. For two years Sak worked with Aileen Eviota, a physical therapist with the University of Illinois Medical Center in Chicago, to improve his functional capabilities and live more independently through the use of a service dog. “Snickers has been individually trained to assist James with tasks which mitigate his disability, including walking, balance, and retrieving items around the house,” said Eviota in a letter to the Aurelia Town Council dated December 2, 2011. Days after moving into their new home, Sak and Leifer were summoned to a Town Council meeting after a small group of citizens circulated a petition calling for the dog to be removed from city limits. Although the dog has no history of aggression or nuisance complaints, the petition urged the Council to “retain as written and without exception the existing City of Aurelia Ordinance, Chapter 58,” which prohibits ownership of “pit bull” dogs. However, because Snickers works as a service animal for a disabled person, the dog is protected by the Americans with Disabilities Act (ADA) and should not be subject to the breed ban, according to 2010 guidance issued by the DOJ. On December 14 the Aurelia Town Council told Sak that he must remove his dog from city limits by the end of the day. Snickers is currently being boarded at facility outside of Aurelia. 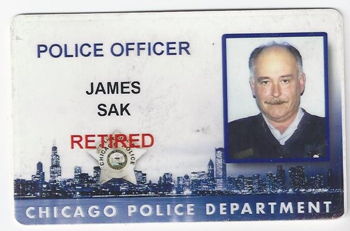 Sak is a member of the Fraternal Order of Police – Chicago Lodge 7 (retired from the 12th District of the Chicago Police Department) and the American Legion – Post 390 of Aurelia (Vietnam Veteran, Army Signal Corps). Sak is pursuing legal action against the City of Aurelia so he can be reunited with his service dog. In accordance with our mission, Animal Farm Foundation is committed to assisting Sak with securing funding for this case. For more information, please contact Kim Wolf at (845) 418-0778 or [email protected]. It’s one thing to have a breed specific law (which I don’t agree with), but it is an entirely different matter when they town is willfully violating the American Disabilities Act. I hope that Mr. Sak gets this resolved. BSL laws are immoral anyway, but what the council has done here is in violation of FEDERAL law, which trumps their ignorance. The city of Denver was sued over this not too long ago, and LOST, so I would think they’d be smart enough to realize where they stand. This is a SERVICE dog who helps a disabled veteran- how low can any group of people, or an entire town, go? Pit Bulls are sweet dogs when raised correctly. I know somebody with a purebred Pit Bull and Jade is one of the sweetest dogs that I know. She doesn’t like being far away from her ‘mommy’ as I’ve noticed. If you look at statistics between a chihuahua and a pit bull, you’d see that the former is more likely to bite you than the latter. I say outlaw the little chihuahua’s that are far more known to bite than a pit bull. I work with dogs on a daily basis and to be perfectly honest, more little dogs have tried to bite me than big dogs. Most of the big dogs I’ve met prefer to sit on my foot, preventing me from moving so that I may pet them. This man fought for our country during the Vietnam War, and if I know my history correctly, the Veterans from that war were mistreated horribly on their return. However, he continued his service to our country through police work. Now he wants to retire with his dog to aid him. Let him keep his dog. What have the people of that town done for America in their life-times that have made a difference? Nothing, I bet; just childish prejudice against a disabled veteran’s dog. This town is violating Federal Law. Who’s going to win? This little town, or the federal government. This is a no-brainer. Don’t punish one dog and man for the actions of those who misuse the breed. Here are the contact details for the mayor and town council. Website: http://www.aureliaia.com/Aurelia_City_Hall.htm and how sad that their motto is Savor the Sweet Life. @SusanE I’m glad you found this. I’m drafting up an e-mail now. I was going to send an e-mail to the city clerks for forwarding, but I’ll send it to the addresses you listed. Thanks a bunch! @SusanE please see my note about emails, above. Waste of time, sorry to say. Write or call. Do not email. Savor the Sweet Life – WITHOUT YOUR DAMN DOG! @LauraProwicz Hi, once again there is a difference between corporate/private sector and government sector. It is illegal for them to block emails. Sending an email is way more efficient, and better than making a phone call which there is no paper trail, and you’d probably end up with a busy signal or on hold anyway. wow this is just disturbing… I sure hope Mr. Sak wins this and gets Snickers back. and as far as City of Aurelia, they owe him a HUGE apology. I agree with everything maxiemom says.More people are bitten by Golden Retrievers actually than “Pitties”. And if we want to nit-pick, a Rottweiler has a more powerful bite than a Pit Bull (which I should point out is not even a breed of dog).”Pit Bulls” are more prone to lick you to death than bite you. If you get bit by a “bully breed” dog, you probably did something wrong.CAN’T EVERYONE JUST STOP BEING SO DAMN IGNORANT? !Unless you’ve personally been attacked by a “Pit Bull” and are totally not to blame 100%, then fine, don’t like the breed- YOUR LOSS still. But the majority of people out there just go by what they hear in the news and from other people. The news doesn’t report EVERY dog “attack”. They focus more on the Bully breeds. Fact.If they end up not allowing Snickers to come back to live with Mr. Sak, is the city planning on paying for the 2-year training and accommodations for a new service dog? Service dogs are incredibly expensive and that bond is something that should never be broken in the first place. They’re going up against a federal law- they have to lose this or there is no justice in this country at all. Wow this is just disturbing… I sure hope Mr. Sak wins this and gets Snickers back. And as far as City of Aurelia, they owe him a HUGE apology. I agree with everything maxiemom says.More people are bitten by Golden Retrievers actually than “Pitties”. And if we want to nit-pick, a Rottweiler has a more powerful bite than a Pit Bull (which I should point out is not even a breed of dog).”Pit Bulls” are more prone to lick you to death than bite you. If you get bit by a “bully breed” dog, you probably did something wrong.CAN’T EVERYONE JUST STOP BEING SO DAMN IGNORANT? !Unless you’ve personally been attacked by a “Pit Bull” and are totally not to blame 100%, then fine, don’t like the breed- YOUR LOSS still.But the majority of people out there just go by what they hear in the news and from other people. The news doesn’t report EVERY dog “attack”. They focus more on the Bully breeds. Fact.If they end up not allowing Snickers to come back to live with Mr. Sak, is the city planning on paying for the 2-year training and accommodations for a new service dog? Service dogs are incredibly expensive and that bond is something that should never be broken in the first place. They’re going up against a federal law- they have to lose this or there is no justice in this country at all. E-mail sent and I’ve passed around the e-mail addresses to friends and family asking them to do the same. I know of at least three others who already have. @JerseyMutt please see my note about emails, above. Waste of time, sorry to say. Write or call. Do not email. While in the private sector executives can block emails, this is the government sector. Everything they receive is open to the public and they cannot delete or block emails. if they do they are violating open access laws. I served on council for 11 years in my community and if a resident made a request for information I received, I was obligated to provide it. It is not a waste of time to send emails as a result. While they are not obligated to respond, they cannot and should not block or delete emails. Wow this is just disturbing… I sure hope Mr. Sak wins this and gets Snickers back. And as far as City of Aurelia, they owe him a HUGE apology. I agree with everything maxiemom says.More people are bitten by Golden Retrievers than “Pitties” actually. And if we want to nit-pic further, a Rottweiler has a more powerful bite than a Pit Bull (which I should point out is not even a breed of dog).”Pit Bulls” are more prone to lick you to death than bite you. If you get bit by a “bully breed” dog, you probably did something wrong.CAN’T EVERYONE JUST STOP BEING SO FRIGGIN’ IGNORANT? !Unless you’ve personally been attacked by a “Pit Bull” and are totally not to blame 100%, then fine, don’t like the breed- YOUR LOSS still. But the majority of people out there just go by what they hear in the news and from other people. The news doesn’t report EVERY dog “attack”. They focus more on the Bully breeds. Fact.If they end up not allowing Snickers to come back to live with Mr. Sak, is the city planning on paying for the 2-year training and accommodations for a new service dog? Service dogs are incredibly expensive and that bond is something that should never be broken in the first place. They’re going up against a federal law- they have to lose this or there is no justice in this country at all. Wow this is just disturbing… I sure hope Mr. Sak wins this and gets Snickers back. And as far as City of Aurelia, they owe him a HUGE apology. I agree with everything maxiemom says. More people are bitten by Golden Retrievers than “Pitties” actually. And if we want to nit-pic further, a Rottweiler has a more powerful bite than a Pit Bull (which I should point out is not even a breed of dog). “Pit Bulls” are more prone to lick you to death than bite you. If you get bit by a “bully breed” dog, you probably did something wrong. CAN’T EVERYONE JUST STOP BEING SO FRIGGIN’ IGNORANT?! Unless you’ve personally been attacked by a “Pit Bull” and are totally not to blame 100%, then fine, don’t like the breed- YOUR LOSS still. But the majority of people out there just go by what they hear in the news and from other people. The news doesn’t report EVERY dog “attack”. They focus more on the Bully breeds. Fact. If they end up not allowing Snickers to come back to live with Mr. Sak, is the city planning on paying for the 2-year training and accommodations for a new service dog? Service dogs are incredibly expensive and that bond is something that should never be broken in the first place. They’re going up against a federal law- they have to lose this or there is no justice in this country at all. It is unbelievable to me that these people at the city council AND the people who circulated a petition to present to the council has taken this man’s dog away. Shame on all of those people! I hope the town has lots and lots of money for their defense. my prediction: they will soon be a grease spot on the wheels of justice. buh-bye!! My hope is that this gets a lot more national attention so that the people with disabilities who have a service dog that is discriminated against know they have the right to fight BSL. I’ve worked with people with disabilities in the past and some are too scared to speak up because they fear it will make things worse for them. I hope they see this and realize they have the federal government and the ADA to back them up. The “small group of citizens” who circulated that petition should be incredibly ashamed of themselves. How humilitating for this town– what is lower than taking away a disabled person’s assistance dog? Shame, shame, shame. @LauraProwicz Elected officials are not some corporate executives, and they can’t block emails from so many unique ip addresses… unless they get the email first. If they are blocking emails from concerned citizens, then they’re basically not doing their job. Good Lord, “Snickers” looks like a marshmallow. Pit Bulls make wonderful service dogs.You’re more likely to get bit by a ‘purse’ dog. Okay everyone lets keep up the pressure. I have tried calling their city hall.1. no answer2. busy signal3. answering machine Maybe we are getting to them. Hopefully they will change their decision soon. It’s not the first time this happens with pit bulls, nor will it be the last. Familiar with the story of Lennox in Belfast, Ireland? http://www.savelennox.co.uk/ He is a service dog to an autistic child. Gruesome story how Lennox was taken away from his family. Anyway, Facebook and Twitter are powerful tools in this, so if someone can make a page for Snickers? Start up a global petition at change.org, post the contact details of the mayor and such, call them and ask them why etc etc. We did this in Belgium when a Beagle was abused and neglected by the family where he stayed, and it took a lot of effort and perseverance mostly to get him out of there while the police and the law were not cooperating. The (criminal) family took off and left the Beagle, while there was already a Berner Senner who had died of malnutrition and whose dead body was just left there in the snow… people made a fuzz, and that’s the only way to go, alas, if the authorities are blinded by so called rules and prejudice! I’m already caught up in another scandal as a writer/journalist/researcher, that of the teacup puppy brokers who import their doggies from South-Korea, at 3 months of age or younger which is in violation of the law. The USDA has not implemented it yet, this particular bill had already passed in 2008!! So it’s up to GRASSROOTS initiatives to show what democracy really is or should be about, I guess. Get the word out, let people know about Snickers the Service Dog. Tell his story, and that of Officer Sak. You have to wonder about the people who petitioned to get Snickers removed, do they have a heart? Do they have pets themselves? There has been a request for an injunction to be filed along with an expedited hearing in the US District Court of Northern IA. I read the brief and unless the judge simply ignores legal precedence, this should be an open and shut case for Mr. Sak. The city council is in clear violation of federal law via the Americans with Disabilities Act. @StubbyDog Got it via your FB page. 🙂 Thanks! I hope the momentum keeps going and Mr. Sak gets his dog back in short order. Meanwhile, I have set up a Facebook page for those who would like to support James Sak and “Snickers”. It’s called, Aurelia, IA Let James Sak Keep His Service Dog. As a professional in the corporate IT world, please be advised that sending email is total waste of time. IT people get called in on weekends and after hours and on holidays for the sole purpose of blocking emails that EXECS don’t want – deserving or not. This is not limited to spam but also legitimate email. There is no requirement for them to receive or acknowledge emails but phone calls and letters are logged. Summary: Don’t bother sending email. Call or write hard copy letter via US Mail. @LauraProwicz This is misinformation. It is actually against the law for public/government officials to block emails of concerned citizens. They are not some corporate executives. While I understand that you work in IT and have some experience with computers, this doesn’t mean you understand how the law works, and going through and discouraging people from sending an email individually is detrimental to this situation especially since emails are an excellent way for people to voice their concern. They are easier to send out, and they also provide a paper trail. An email will not put you on hold, or give you a busy signal. @[email protected] Absolutely Michelle. To piggyback on what you said, three of the e-mail addresses listed below are hotmail addresses. The best the users of those e-mail addresses can do is send e-mails to their spam folder, but they have to do that for each incoming e-mail address so e-mails are still going to get through. I hope they go to change.org and start a petition for this….. I would just like to say in the spirit of someone who has been in IT for a lifetime and “seen it all” : your misplaced faith in public servant’s intentions and actions to receive, keep and log emails (esp. those on a third party, “public” email system like hotmail) is both amusing and naive. I don’t really care what you do, I just thought if you were going to go to the trouble to write to the town, that you’d like your correspondence to actually mean something / make a difference. Do what you like. Me personally, when I work to oppose BSL, I make phone calls, write hard copy letters and show up at city council meetings. Something Pony Club has taught me over the years: “some things in life are just about showing up.” – and email / Facebook doesn’t count. Not that I don’t wish it wasn’t that way, it is just reality.